The addition of roof windows to a new extension or to an existing part of the home is a wonderful way to let in additional natural light. What is more, adding such a feature to a room can bring character and style, transforming the ordinary and making it spectacular. 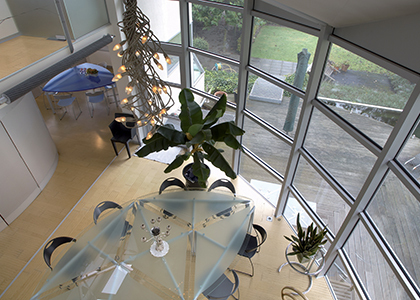 Reynaers at Homes opening aluminium windows are fitted with a state-of-the-art multi-point locking system and our internal glazing bead prevents the removal of the glass from the outside. Combined with some clever design, this means our windows are amongst the most secure on the market, meeting and often exceeding the requirements for some stringent British and European security standards. Curtain Wall 50 gives you complete freedom to replace your existing solid walls with very large glass walls opening up your living space and bringing the outside in. Perfect for those innovative grand design projects. 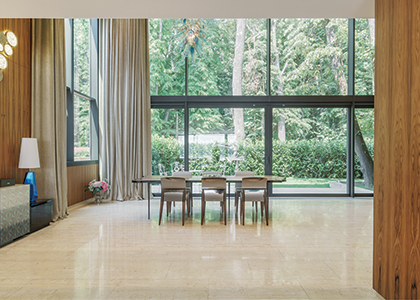 Curtain Wall 60 gives you complete freedom to replace your existing solid walls with very large glass walls opening up your living space and bringing the outside in. The 60 mm profile depth makes CW 60 ideal for very heavy glass panes. Whether you want a single fixed roof window or an ornate roof lantern for a flat roof, Reynaers at Home will have a bespoke solution, designed to meet your specific requirements.